The Green school committee was formed in late September whereby children had to put themselves forward for nomination. The girls then gave reasons as to why they wanted to be a member of the committee. Such was the level of enthusiasm from classes 3rd to 6th that names had to be drawn from a hat. While the committee is from the senior school members it was agreed that they must represent the whole school body and aim to be as inclusive as possible. The committee meet once a month and pass on information to other classes either at assemblies or over the intercom or by going class to class. Having completed a review the committee decided to focus on where does the water we use come from and to reduce waste on yard, to promote responsible use of water in the new school buildings and to maintain the hard work completed by the previous Green school Committee. Litter and waste on yard had begun to increase so the Committee needed to tackle this. They also agreed that a campaign to bring awareness to global warming issues would be beneficial. The committee conducted a survey to assess the schools knowledge of where there water comes from and their water usage. The survey found that while there was a good level of awareness, more could be done to promote responsible water use. The committee also felt that the school was unaware of their water usage and where it came from. They contacted the local water authority for further information also. 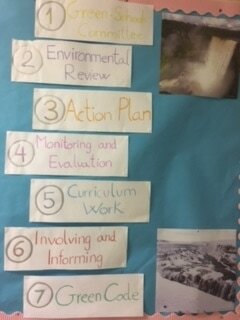 Below is some of the actions taken by Scoil Mhuire on the water theme. 5th class completed a water usage survey, review water usage from the last two years. 3rd class counted all taps, cisterns and sinks. Green school code, updated and reviewed. Each class given a copy to sign and display in their classrooms. Turn it off campaign updated to include taps and light switches. Leaky detectives were appointed in each class from junior infants to 6th class to monitor taps and to check for leaks. Green school notice board was redecorated to display and reflect this years work. “Water action week”- 20th of January to 24th of January- Every class completed a science experiment with a water theme. 4th Class completed a Sceince Fair- showcasing many water themed science experiments for the whole school and parents. All classes completed a thematic unit on water focusing on where it comes from and why we should conserve it. Each class entered the Water Poster Competition- promoting clean water and Sanitation. 1st class created posters for use around the schools sinks to remind everyone to use water responsibly. Each class was given a copy of Scoil Mhuire’s green school code to sign . Each student has to promise to try their best to uphold the Green School Code. Action Day will take place on February 14th. Water relay as part of Sports Day. 2nd and 3rd classes created songs, poems and slogans to promote water responsible water usage. Clothes collection day 14th of February to promote recycling and the “Big Water Quiz”. Save the Arctic and Antarctic projects by 2nd and 3rd Class displayed beside Green schools notice board. Contacted Irish water to invite guest speaker to discuss water conservation and sanitation. 5th and 6th class visited the local beach and completed a “walk for water”. Children are involved in the Big Travel Challenge to encourage children to walk to school. Each class has a “leaky detective” to monitor running taps, watch water usage and ensure that taps are switched off after school. 5th class are monitoring the schools water usage and publishing data on the number received. They are given the water meter rates by the school secretary and formulate graphs on the usage to be displayed on the schools notice board. Each class has signed the Green school code and has it displayed in their classrooms. The previous themes have been monitored and were focused on heavily in the first year of the theme and first few weeks after holidays in September, November and January. Litter Monitors patrol the yard twice a week to ensure milk cartons are put back in the bin. Junior and Senior infants reuse paper from the photocopier and old worksheets during Aistear time for the writing table. During aistear time the children are encouraged to make things from recycled materials for the junk art station. The Green school committee does spot checks of the classrooms bins to make sure that they are putting the correct waste in each bin. A follow up survey will be completed in March to assess children’s knowledge of water processes and actions. Through completing the above work the theme of water has been linked to several curriculum areas. Developing a sense of citizenship and a sense of personal responsibility and social responsibility. Promote communication, co-operation and working with others. The above was achieved by working together in group projects, as part of committees, creating posters, songs poems. The children cooperated to complete many activities and overall promoted the cause of water conservation and usage. Children created posters and projects to help promote the theme of water throughout the school. All posters and projects were displayed and children were encouraged to come and visit the Green schools display board to help promote the water theme. Data- graphs were created and displayed to highlight water usage. Children also learned about tallying surveys. Capacity- children learned about water usage and methods of measuring water. Number- children calculated and added results together to gauge water usage. Children counted number of taps , sinks and cisterns. Children learned about the water treatment process. 5th and 6th class went on a “walk for water “ to the local beach learning about their local natural environment. 3rd Class learned about the rivers and lakes of Ireland. Junior and Senior Infants/2nd/3rd class studied the Arctic and and the Antarctic. They learned about the effects of global warming on sea levels, ice bergs and the local natural environment . Projects were completed on global warming and awareness was raised about climate change. Children examined maps to learn Irish rivers and lakes. Children listened to Ludovico Einaudi play on a specially built ‘iceberg’ within 100m of a crumbling glacier as part of their campaign to save the Arctic. Children learned about the changes in access to water over time. How long ago people used wells etc Aquaducts in ancient Rome etc. 5th Class learned about St Brendan a voyager across the sea. Senior Infants learned about Tom Crean and his exploration to Antarctica. Senior Infants- explored how plants use water and made boats of plasticine. Senior Infants/First- explored what materials are the most absorbant. First class- How can we help water keep its heat? 5th Class- Comparing tap water, sea water and pond water. Green code- assemblies and announcements. Step 6: Informing and Involving. Green school notice board redecorated and updated to reflect new year of work. Assemblies led by committee to announce new plans and targets. Announcements of news and upcoming events made over the intercom to inform all students. Water action week January 10th – 24th. Day of Action – February 14th. Email to parents of news and upcoming dates. School website updated to reflect news. Project work on climate change displayed beside the schools notice board. Green school committee members read books about water conservation to junior classes. Lainey Martin created a powerpoint to inform all senior classes of the water cycle, its usage and how to conserve water. Big water Quiz on water action day. Water Science week- All children complete water themed science activities. Projects completed by all senior classes on the water cycle. Conservation projects completed by 2nd and 3RD class to promote saving the Arctic theme. Water surveys went home with senior classes and conservation tips went home with junior classes. The Green school code was updated and sent to each classroom . All the girls were read and discussed the Green school code. They each signed a copy and promised to try their best to uphold the Green school Code of Scoil Mhuire. We the staff and students of Scoil Mhuire are dedicated to creating a clean, healthy and pleasant school environment. We feel it is important for the school community to have an awareness and understanding of the effects of their actions upon the environment in which they live and work. Continue all recycling and composting. Walk, cycle, scoot or take the bus to school. Keep doors and windows closed when the heating is on. Respect the plants and animals on our school grounds.